Last week, I was blessed to teach a two-hour seminar in our church’s discipleship counseling training center on the subject of depression. First, I shared my own personal experience with depression and anxiety, and then drew attention to the experiences of people in the Bible. Together, we noticed how they were tested, worked through their times of distress and despair, and how they reached out to the Lord for help. One student asked for a list of questions which might be helpful to ask the person who is struggling with depression. What a great question! Consequently, I reached out to our church’s team of counselors. Here’s what we came up with, but, as you will quickly realize, the questions are applicable to a multitude of struggles beyond depression. What do you mean when you say you are depressed? How long have you felt depressed? Have you ever felt like this before? If so, when? Why do you think you are depressed? Have you recently suffered loss in any form (E.g. death of a loved one, loss of employment, financial setback, decline in health)? Have you recently received bad news of some sort that you are having a hard time accepting? Is there a relationship with someone that is breaking down, disappointing you, or coming to an end? Are you under spiritual attack? What has changed in your life recently that might be making you feel depressed? When was the last time you had a complete physical check-up with your family physician? Are you currently receiving any form of treatment for depression? How often do you exercise? For how long? How do you think God fits into all of this? Has God been teaching you anything about yourself or your circumstances? What do you think God might want to teach you while you walk through this valley? How might He want to help your faith grow stronger? What have you done to try to deal with your depressed feelings? What have you done to try to deal with your difficult circumstances? What do you think would make things better? What are you thinking about when you awake first thing in the morning? Can you tell me anything that encouraged you recently from a sermon at church? What two words would you use to describe your prayer life? Is there any ongoing or unresolved conflict in your life? If so, have you done all that is in your power to resolve it? Sometimes depression is related to anger. Do you think you are perhaps angry at God for taking something or someone away from you? Often depression is a brother to anxiety. Is there anything in particular that you are worried about? Do you feel badly about something you did in the past, or something done to you? Is there anything you have done that is causing you to feel ashamed? What is one thing you really want to get out of life? Do you think you are currently getting this? Is there any person in your life whom you feel you will never be able to please? Is there anything or anyone you believe you could never live without? Are there habits you practice to make yourself feel better, but then realize later that it did not last? For example, do you eat in excess when you are depressed? What kind of music do you listen to? Does it encourage your soul? Does it direct your heart to hope in God? Are there unfinished tasks weighing on your mind? How do you spend your free time? Is there any area of your life where you are disobeying God? Is there sin you are cherishing or refusing to confess? Is your depression affecting you physically? Is there anything that keeps you awake at night? Do you have a trustworthy friend to talk openly with about the things that bother you? Do you read the Bible regularly? Is there a Bible verse that has recently encouraged you? Would you consider yourself a perfectionist? Is there a failed expectation you cannot accept? Are you over-committed? Have you over-extended yourself financially, at work, at church? Do you ever feel like a failure? Why? Is there a goal that you have failed to meet? A foolish person jumps to conclusions before trying hard to understand a person’s situation. But Proverbs 20:5 teaches us the importance of seeking understanding: “The purpose in a man’s heart is like deep water, but a man of understanding will draw it out.” Remember, an accusation often hardens the will leading to resistance, but a question often stirs the heart leading to understanding. 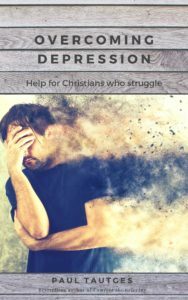 *This and other resources have been combined with a walk through a portion of Psalm 119 to create a study guide and workbook, Overcoming Depression: Help for Christians who Struggle. This workbook is designed for personal and small group use, as well as counseling homework.